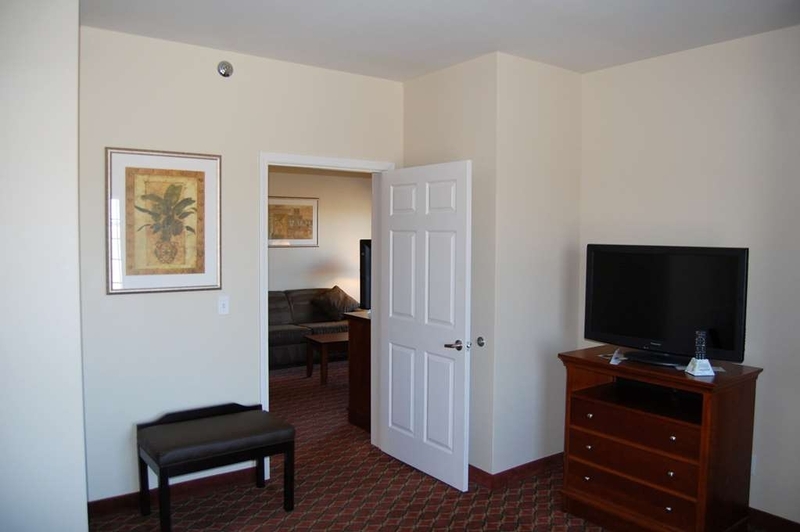 The Best Western Plus MidAmerica Hotel is ideally located in the center of Mascoutah. Come and experience our hotel near the major tourist attractions. Best price guaranteed and exclusive deals. 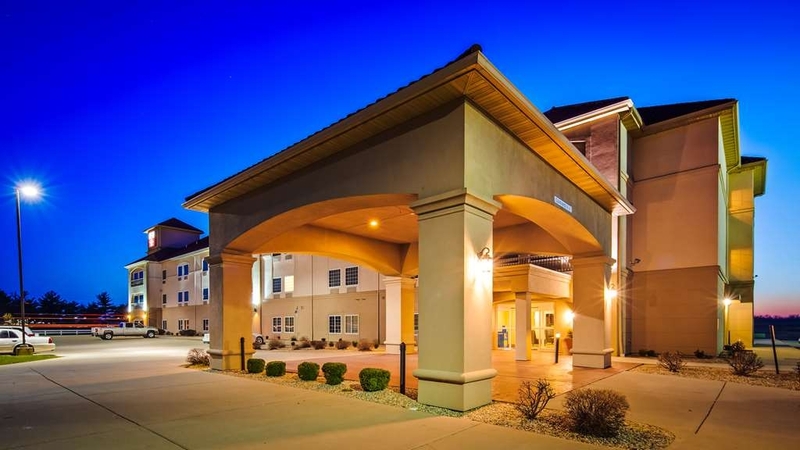 Stay close to everything at this Mascoutah hotel, whether it's the Scott Air Force Base or an event at McKendree University. Staff members are proud to regularly host service men and women along with their loved ones. The property is a short drive from MidAmerica St. Louis Airport, making catching the next flight easy. There are a number of things to do in the area, and spending a day at the World Shooting & Recreational Complex is a favorite for many guests. Business travelers with the Boeing Company and those in town for SAFB alike take advantage of our Mascoutah location, which puts the best destinations minutes away. As the closest hotel to the base, we take pride in offering a home away from home for those who serve. We’re also the closest hotel to the airport and the closest to the university, so it’s no wonder why our property is a go-to option for frequent visitors to the area. Whether it's academics, a stopover or business at the base that brings travelers to town, staying at a comfortable, convenient and affordable property is a must. Annual events at the nearby shooting complex, especially in July and August, bring large groups to the area, and we’re happy to accommodate with blocked rooms. Athletic events at the nearby university mean that we welcome fans and teams alike. The perfect compliments to game day are pillow-top mattresses and quiet, spacious rooms. St. Louis Cardinals Baseball season is something everyone looks forward to, and guests here for a game enjoy a fast commute and genuine hospitality at this Mascoutah hotel. However, for those who are looking for a dream location for the big day, Hidden Lake Winery Weddings located in nearby Aviston, Illinois, is the ideal setting for a fairytale come true. 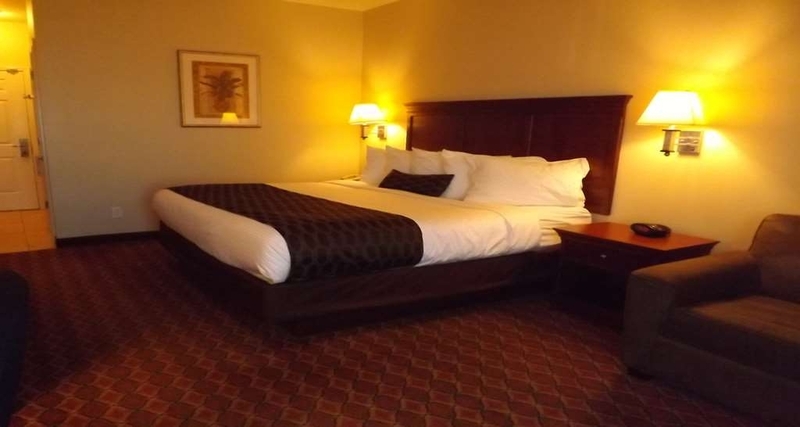 Reserve a room at the Best Western Plus MidAmerica Hotel now for competitive rates! Enjoy your stay. We stopped here in the middle of yhe night while driving home, it was right off the interstate. The Hotel lobby and room was very clean and staff was courteous and helpful. The free breakfast was great and the staff kept everything well stocked. "Great hotel just off the highway"
This hotel is great if you need a nice hotel that is quiet and just off the highway. There is a dominoes very close and a gas station less than a mile away. Usually not very crowded, with an ok fitness center and a small pool. 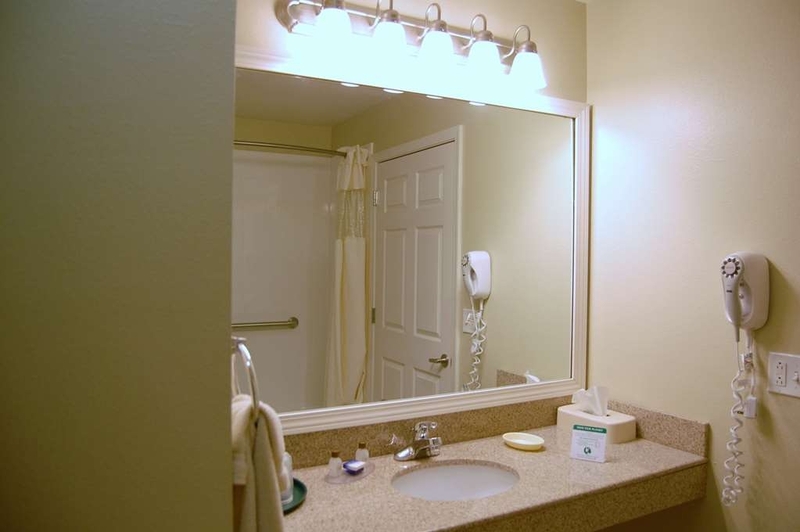 Very clean property, safe venue, and exceptional well trained staff. Pool and surrounding area is well maintained. Rooms are sizable and quiet. Internet is high speed and consistent. Parking lot is well lit. 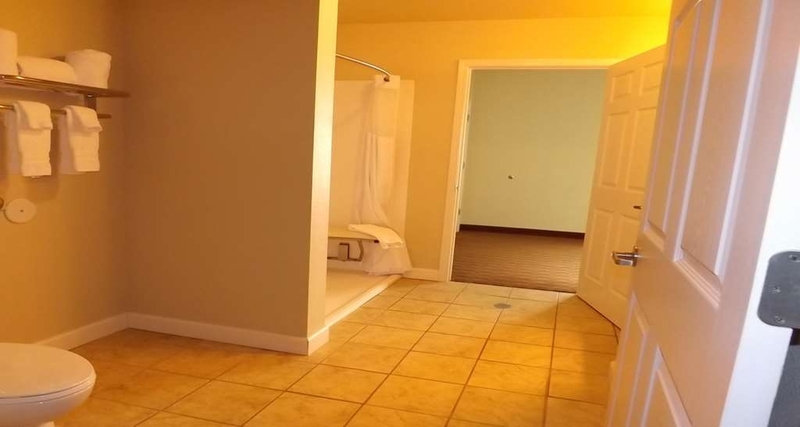 "Wonderful,clean,safe location, near McKendree University and Scott Airforce Base"
I know what you are thinking, a Best Western, you never know what kind of shape they are in. But don't fret, this is a best western deluxe, so it is a nice, comfortable hotel environment. Clean, spacious rooms. Our king room had both a comfortable chair(which I am writing this from) and a love seat, plenty of room to relax. Our king bed was comfortable and we had 5 pillows on our bed, so plenty for the pillow hog in our life (hint, hint). A wonderful continental. Real fast with plenty of. HoI es for the quick on the go meal, families or a casual sit down. Even frittatas were served today. Our host at the desk was kind and thorough and gave us all the info we needed to settle in. 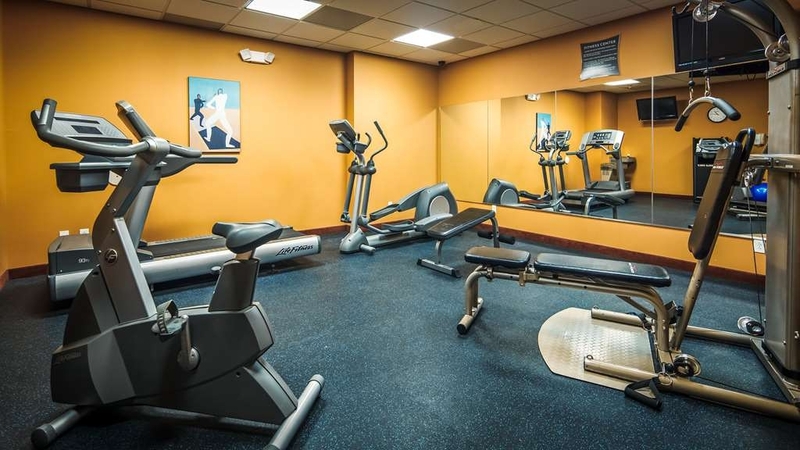 You will experience a nice exercise room, pool and atmosphere here. A great location to stop at before approaching St Louis. Lose to Scott Airforce Base and McKendree University. Our price was great and that was a blessing since we just needed a quick rest before continuing our travel plans. Right off I-64. Near Lebanon and Mascoutah, IL. Have a nice stay! Last minute stay at a great hotel. Very clean room. Hotel smelled good but not like perfume. Friendly desk staff. Quiet room even though we were directly across from elevator. Had a meeting in lobby and were not interrupted. This hotel was used by our extended family for wedding located in a smaller town about half an hour away. The staff here was wonderful and very receptive to any feedback or needs of its guests. I was very impressed by their service. The only downsides my husband and I experienced were with our sleep quality. I could hear snoring and a toddler on the other side of my wall, which wasn't a huge deal. However, the curtains did not cover the side of the window which let in sunlight and a parking lot light throughout the night. The positioning of the bed in the room to the side of the window did not allow for a great night's sleep as the room became too bright earlier in the morning than I would have preferred to wake up. We also re-positioned a microwave located across from the bed so the glow of the clock wouldn't hinder our sleep. Otherwise, our stay here was great! Glad to have found a hotel to get out of all weather conditions. The breakfast was amazing loved all the different choices that they had. All of the employees went out of there way to make sure I had everything I needed. Thank you to all. Thank you for choosing Best Western Plus Mid America for your recent stay in Mascoutah. We are grateful that you left us a review TripAdvisor. You are helping millions of visitors every month plan the perfect trip by leaving your feedback. Our guests often tell us how helpful it is to read past guests' reviews before booking their own visits. And we're always eager to hear what you liked and how we can improve. Thank you again, and we hope you'll choose Best Western Plus Mid America the next time you're in Mascoutah. "Awesome breakfast, friendly staff, overall great"
Seriously, the breakfast is so bomb. They had STRAWBERRY BATTER for their EXTENDED WAFFLE BAR!!! like wtf?!?! We had to stay under very stressful circumstances and it was quick and easy to check in and out. Staff was friendly and helpful. Had a great stay! "WARNING NOT SAFE no parking lot security"
WARNING PARKING LOT NOT SAFE!!! Management doesn't care. Management never contacted me. I asked the woman behind the desk when I checked out if they would refund my money for the stay. She WAS the manager and never introduced herself. Out in the middle of nowhere, 30 miles from the Missouri state line, well lit, but NO SECURITY!!! Woke up at 12:30am due to another resident witnessing cars being broke into. My truck was vandalized and robbed. This cost me $1000 in insurance deductions which was a fraction of the damage. Party Line response from management is the same for every negative review "Sorry we didn't exceed your expectations." Sorry doesn't cut it. I never asked anyone to exceed my expectations. I only asked for a safe place to stay. If they broke into several cars imagine how safe it is to walk to your car? Video means nothing if no one is watching it or tries to stop the action. Police said "Hello Elaine, Hope your trip.went well, the hotel surveillance system was of no help for the reporting purpose for the incident... Officer Glander" . Stay someplace else. If you would like a video of the damage, just ask. Tripadvisor wont let me include it with my review. Again, we are sorry that you experienced this. It is a frustration to be a victim of crime. As it is still an active investigation, please contact the police for any updates in your case. Very courteous staff in all areas. Breakfast was very tasty and the selection was wide and varied. Maid service was great. Again, all of the staff was most gracious. The only suggestion for improvement would be to replace the incandescent bulbs. The room was great. The staff were very friendly and helpful with our plans and side trips. The Breakfast was great. We stay there every year and it just gets better. 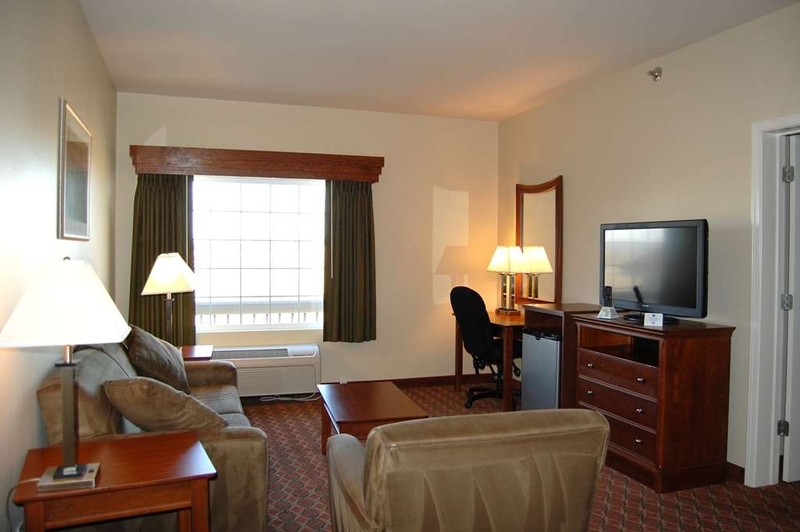 Easy access to all our events and quiet..
We stayed here for business while visiting Scott AFB. It is the closest hotel to the air base which made it easy for us. The hotel is clean, and staff are friendly. There is a pool on site which we didn't have time to use but this is a plus. The rooms were comfortable and the only thing I needed which wasn't in room was a USB charger. The breakfast is quite good and offers waffles, cereals, fruits, pastries and eggs and sausage. This was plenty for us. The hotel is on its own and we drove 10 minutes back up the road towards the other hotels which had restaurants and shops close by. We would stay there again if visiting the air base. Thank you so much for taking the time to leave us feedback. We appreciate your review. We checked in very late and missed breakfast the next morning. When I came out to buy a snack about 10 am, the staff insisted on getting some breakfast and a fresh coffee in the cool new coffee machine. They were so friendly and helpful! Thanks so much! Thank you so much for taking the time to leave us feedback. We appreciate your review. I am glad you enjoyed your bagel and the coffee from our new machine. It was a pleasure having you stay with us. "A little gem on the prairie!" I stayed here while on a business trip visiting a client in one of the small towns east of St. Louis. 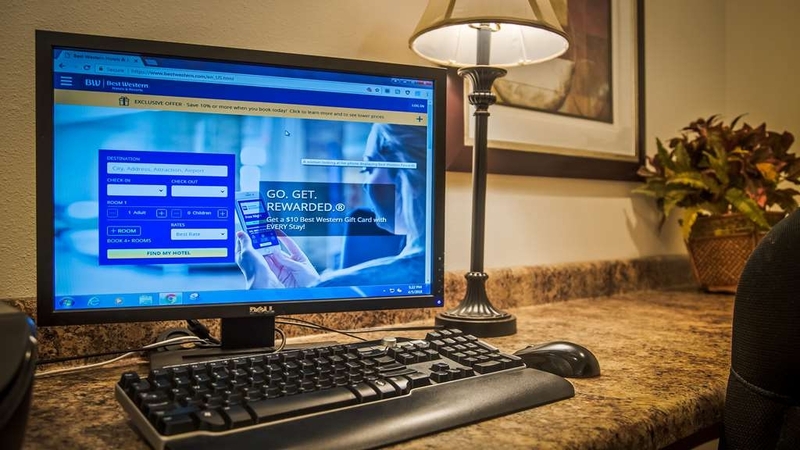 A colleague had previously stayed at a different hotel recommended by the client and had given a "meh" review, and as I always have good experiences with Best Western's, I was happy to see the MidAmerica Hotel nearby. Rooms are well appointed, staff is wonderfully friendly, and even though it isn't located in a commercial centrer, there are just enough nearby amenities to make it a very comfortable stay. I will absolutely seek out this property again! Thank you so much for taking the time to leave us feedback. We appreciate your review. Please come back and stay with us on your next trip. Thank you so much for taking the time to leave us feedback. We appreciate your review. It was a pleasure having you stay with us and look forward to your next trip with us. Vehicle was broke into, among about 7 or 8 others! Nothing caught on security cameras! Was not offered an apology, discount, or anything at departure that day! You would think that some security cameras would at least be working and caught something since vehicles in front and side of motel were broken into! Probably same situation on the inside. A really nice hotel near the interstate in a quiet area. Excellent rooms at a great price. Very clean, fresh. We remarked it must be brand new and the desk clerk said they had been there 10 years. Excellent upkeep. Very quiet and comfortable. Great breakfast. Super staff. I'd give 'em a 5, but 5 cars were broken into overnight- not mine. The staff were mortified and seemed to be very helpful. Wouldn't deter me from staying there again. Great place. My wife and I stayed over night here to be closer to Christmas Shopping day. This property was originally a LaQuinta. What we look for the most in a hotel is a clean room, clean everywhere actually, and the feeling of safety. Upon check in, we did find the lobby area was clean. Our room was also clean enough...there needs to be some vacuuming done behind tables, desks, etc...areas I'm sure they don't hit every day. The climate control worked fine. There was endless hot water, although I thought the water pressure could have been better. Breakfast was okay...basics really and we are not big breakfast eaters. I had a doughnut and my wife cereal and toast. This would be a great place to stay if you are flying out of Mid-America Airport...or even if you want to stay away from St Louis. Very easy on/off to I-64. Feel safe here, no worries. A good, clean, safe...but average hotel. "Love the cornfields and Quiet"
We selected this location on a cross country drive rather than going the 30+ miles on into St. Louis. The location is not on the interstate, but the signposting is good which is essential since it's set just east of nowhere--surrounded by fields. The advantage of this location is blessed peace and quiet after a day being bombarded with road/traffic noise. A slight disadvantage was finding a place for dinner but a bit of a drive to Lebanon rewarded us with a great dinner spot recommended by front desk staff. The hotel was clean, modern and comfortable. Two queen beds pretty well filled the room, but we were there to sleep not work so that was fine. Typical chain motel breakfast was generous. Woman staffing the breakfast room was very helpful and really made the morning pleasant for us. "Not so much a "Plus""
The rooms are clean and comfortable. Even though there is an interstate close, the rooms were very quiet. We had a particular problem in two areas. One was the slippery shower. Today most hotel provide a floor mat for the tub. I almost fell the first time in the shower. I found I had to wedge my feet so I had stability in the shower. It made it very uncomfortable and tricky. The other was the comforter on the bed. They placed a comforter inside a bag, I suppose, to keep it clean but it was just loose in the bag. I toss and turn a lot so the comforter ended up at the foot of the bed and I am constantly tugging on the bag to keep it over you. Easily corrected. This should not be an issue at a "Plus".Overall this hotel is nice but, in my opinion, does not rate a "Plus". I have stayed at many Best Western. I am a Diamond Select rewards member. I can honestly say, that in my experience, this is a nice Best Western. It was clean and quiet. NOT the best breakfast tho. It was a last minute stop very late at night and during a horrible storm. Found it by accident. Definitely need a sign you a can see off highway as we had past it by several miles and had to turn around and go back. Need more lighting outside also. "Repeat Customer - We LOVE This Hotel!!" We have stayed at this hotel at least 10 or more times over the past few years. We have family that lives locally and have chosen to stay here every time we come in town since our first visit - this hotel is always a great value! Every time we come we receive high quality service and amenities for an amazing value - the front desk manager, Diane, is amazing!!! She is extremely polite and always helpful. The rooms are immaculate, as is the pool and the exercise facility - the WIFI is lightening fast - and best of all, the FREE continental breakfast is AMAZING!!! They serve several different kinds of fresh baked goods, bacon, sausage, frittatas, waffles, a variety of juices and even more that I cannot remember - my children absolutely LOVE the breakfast - the only thing that was not the best this last time was that the bananas were green??? Other than that, this hotel feels and looks brand new, service is fantastic, and we will continue to stay at this Best Western every time we visit our family! 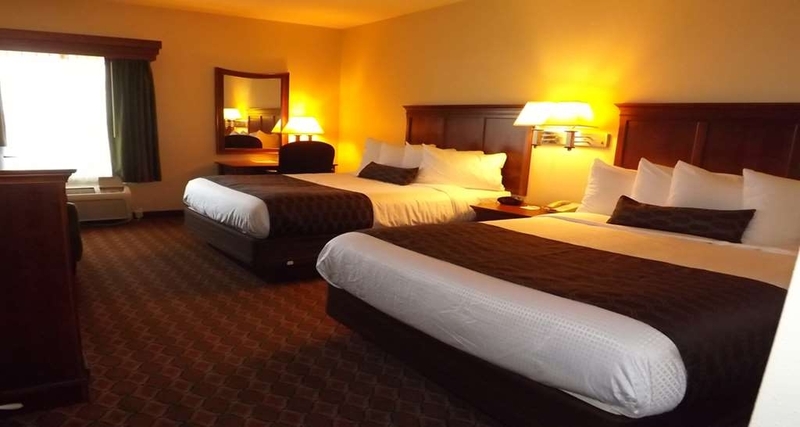 "Overnight stay before early morning flight"
"FAMILY FRIENDLY / CLEAN / COMFY / GREAT VALUE"
A very nice family friendly hotel away from the O' Fallon traffic congestion but still conveniently located next to SAFB. *The hotel rooms were very clean, cool, well lit, well maintained, and comfy. *The free breakfast each morning was hot, fresh and very nice. *The front desk and cleaning staff was professional and polite. *Lots of parking around the building and was well lit at night. *I would definitely recommend this hotel to anyone traveling to Scott AFB or flying out of MidAmerica Airport. The location off of I-64 makes it easy to get to the base in 5 minutes and to MidAmerica Airport in about 1 minute. "CLEAN and Friendly with Huge Breakfast!" We were very impressed by the place. It was very clean and well maintained. The staff were very friendly and helpful. Free Breakfast was great. Plenty of protein for low carb people(eggs, egg wraps, sausage, bacon etc.) and if you want to pack on some carbs look no further(fresh donuts, waffles, fruits, toasts, bagels, cereals you name it!). Rooms were very roomy. Our kids loved the indoor pool. Would stay here again if our travels bring us through O'Fallon-Scott AFB area again. This was a great place and we were very impressed for the price. I Searched prices online and chose to stop in Mascoutah for the night because my search showed their Best Western having the best price in about a 2 hour drive either way. When I arrived I wasn't even sure if the business was open because it was not well lit. When I went to register I was quoted a rate almost double of what I seen online. When I questioned the desk clerk I didn't get an answer - just "the look" Since it was later in the evening and my family was tired, I sucked it up and paid the bill. It was just after 8pm and the pool was locked. There were other guests waiting by the pool door for the rest of their party, who went to the front desk to see if they could get in the pool. They returned stating "she said it's closed" We already had a long day and then had been driving for several hours, so we just gave up and went back to our room to get ready for bed. We should have just kept driving through to our destination and saved the $125. "Average for a Best Western"
Other than seeming to be in the middle of nowhere, this is just an average BW. We have stayed at a lot of them and this one was neither bad nor memorable. It is just average. I really wouldn't call it a BW Plus. It is to far from any good restaurants. 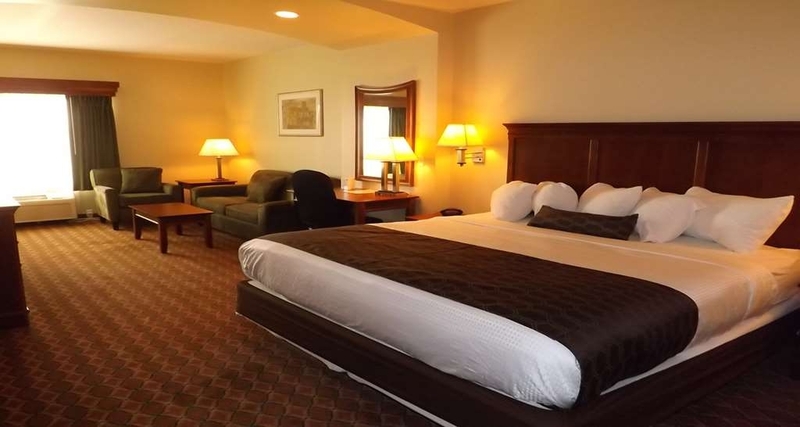 The rooms are clean and quiet and the staff efficient and the price was good. But if I were in the area again I would not choose this place. Also, the breakfast was not as bad as a lot of reviewers have said. "Great if you like heat"
This hotel has an energy management system that shuts the air conditioning off at 5:00 pm every day. For guests that come back to the hotel expecting to find a decently cool room welcome to this hotels form of hell. Management basically offers you a fan and tells you that your room will cool down quickly. Which after sitting in a 90 plus degree room for more that 2 hours it has yet to start cooling off. Guest comfort is not a priority for this location with rooms costing 120+ Dollars this hotel is not worth it. You would be far better served having a tent probably cooler and cleaner than the rooms at this location. I have stayed at this location many times over the past 10 years with this past stay being my last. I will take the extra 10 minutes of drive time and go to a hotel that cares about their guests. During this stay I found multiple trash items in the room even a pill on the floor from previous guest it's quite evident that this hotel is not what is wince was. This Best Western was clean. The staff was courteous and helpful. The bed was comfortable. The breakfast was fine. The overall cost was good. This hotel was much better than other Best Westerns I have stayed at in the past year. A good hotel experience for me. After staying at a few poor hotels, this room was a welcome relief. The bed was comfortable, room was clean, breakfast was hot and varied. Internet actually worked as advertised. Beverage bar evening was very appreciated. Best Western Plus is my new preferred place to stay on the road for a modest price. This place worked out great for me. My dog and I were traveling to FL to visit some friends and it was a great relief to see a BW on the highway given their pet friendly policy. There was a surprising amount of green space to let my lab stretch out a bit. Other than that, the room was clean, staff was friendly and breakfast was great. It may have been because I stayed on a weeknight, but the place was also remarkably quiet. "bad attitude at a hotel that i rated a 4 or 5 dafter our last stay"
after working all day outside and in an attic, with outside temperatures reaching 98deg. that day and heat indexes around 109deg., when I checked into the hotel and went to my room, I found that the air conditioning was turned off!!! since the room was around 88deg. it would take forever for the a/c to cool the room down! I went to the front desk and asked if there was another room that we could have due to the a/c being off. I was told that all of the rooms a/c are shut off...it was the manager's policy to save energy... the desk clerk moved us to another room on the ground floor that would be easier to cool down (that's right, the a/c was off on a 98deg. day!). I told the clerk that we were working in the same attic the following day and outside and the temperatures were going to be the same (it was around 148deg. in the attic...) and to please NOT shut my a/c off in my room!!!! I was told that the a/c would be shut off anyway and that the manager programmed the thermostats to automatically do such. in the morning, I talked with manager on duty and stated my concern with the a/c being turned off. I was told that was an energy saving policy and the thermostats would shut off the a/c automatically. I asked that the program be overridden for my room and was told it couldn't (or wouldn't). I then cancelled my room for the upcoming night. I told the manager that all we wanted to do when we were done working (which was around 9pm each night), was to come to our hotel and walk into a cool room, shower and relax until the next day's work began and that this would be impossible in a room that was close to the outside temperature due to the a/c being turned off! I also stated that we were cancelling our room for the upcoming night and would go to the Hilton Garden Inn since they leave their room air conditioners on. at this comment, the on duty manager shrugged her shoulders and said "oh well".... I am a BW Diamond member and have stayed at this hotel before (the a/c was mot turned off during our last stay so the manager's policy must have been something new...right in the hottest part of the year! I also noticed that my rate had increase on my bill for the night that we did stay, due too the cancellation of the room for the following night. we stay at Best Western Hotels al over the US and Canada. this was by far the worst attitude that I've seen by management at any BW in the country. I will have to rethink where we stay from now on when we travel (which we do extensively since we are retired). The Best Western stands by itself just off Exit 23 on I64. The hotel checkin went smoothly and the clerk was really nice. The room was clean and the bed was comfortable. The AC wasnt working properly but we didnt discover that until so late we didnt want to change rooms. There were two light bulbs burned out. We got a replacement for one bulb then let the staff know about the other. The new light bulb flickered which made it hard to work. So we moved that one and switched with another which didnt flicker. Breakfast was great. Scrambled eggs, Frittata which is a type of omelet with green peppers, Waffles, Bacon and sausage and four types of dry cereal plus yogurt and milk. Cracker Barrel and Target are just down the road at exit 16. This hotel is recently updated, very clean, quiet and the bed and bedding were very comfortable! Breakfast was good, easy access to the highway, and there was ample parking. We will definitely stay here again!! I will return to this hotel. Great location, customer service, and room! The bed is comfy! The hotel is newly renovated and clean. It is only minutes away from any shopping you'd like to do aloby with many restaurants. Takes awhile for someone to come to front desk. Pool was cold for a heated pool. Excellent breakfast with a variety of options. Decent stay for the price. Everyone was friendly. Walls are VERY thin. We could hear the person in the next room snoring. Beautiful facility and top notch service. This hotel was everything I was looking for- clean, friendly and easy to access. The staff was very courteous, and we look forward to our next stay. This hotel is easy to recommend. "Short Stay assisting Family near by this location"
Hotel was Easy to access. Check in and out was extremely quick and easy. Room was clean and nicely decorated.No problems with amenities in the room. Staff was courteous, polite and helpful. i have family near and will stay here again when needed. "Great place for a night"
This hotel is conveniently located right off the interstate and is a great place to stay for the night. A quick Google search will get you to a Wal-Mart or other location if you need something you can't find at the nearby gas station/convenience store. The hotel staff is really friendly and ready to be helpful for anything you need. Our room was spacious and clean, and we used the wi-fi on our phones and a laptop with no problems. The breakfast in the morning had a lot of good options and was well stocked. Our only complaint would be the pool was closed when we visited. We had considered the pool when we made our reservation and finding it closed was a big disappointment. The location of the hotel and the other amenities offered makes it likely that we would have booked a room here anyway, however, it would have been nice to know about the pool in advance. I chose this hotel and made an advanced reservation; it was convenient for our travel which includes driving north on Illinois Hwy 4. We were greeted and checked in a timely manner. The room was nice and well appointed. The bed was comfortable. Overall a very nice comfortable stay. But.................. 1. the WiFi was 'weak' at times. I noticed it appeared they use satellite service for this. 2. water pressure at the bathroom faucet was weak. 3. Shower pressure was weak too. 4. Breakfast was not very good: coffee was weak, even in the 'bold' setting. Milk container was empty. 'Hot' items were of the "pre-prepared" variety.....not tasty. I will maybe have to say the reason the breakfast area was poor was due to lack of attention? For a BEST WESTERN "PLUS" I was expecting more. I felt some of the amenities were lacking. For comfortable room and good bed this was a plus facility......for some of the other expectations it was not. Your basic hotel, but clean and comfortable. The hotel was fairly quiet for being next to the interstate. A little road noise in the morning. A couple of restaurants nearby. We went to the Juicy Peanut down the road and 1814 Eat Drink in Lebanon. Both are worth the 6 minute drive. 5 minutes to Scott AFB. The breakfast was also very good. This hotel is very clean, affordable, excellent, courteous staff ready to help with anything one would need. It is easy to get in and out, convenient to gas and eating places. Would recommend to anyone staying in this area. "Nice place right off interstate 64"
My stay was exactly what I wanted it to be. It's a nice place, close to home and close to shopping. I went to a movie, shopped and took a hot bath, exactly what a busy working mom needs this time of year! My room was quiet and clean. The bed and pillows were comfortable. Everything worked in the room. The breakfast was good and hot just like I always expect at a Best Western. I'd definitely recommend staying here. I always love to see the disinfected remote controls too! Keenai Sampson was working at check-in when I arrived. He had a local college shirt on so we spoke about that. I was surprised to learn the next day that he had only worked there a couple of weeks. He was a good, friendly 'face' of the Best Western brand. The room was clean and comfortable with a nice bed and pillows. The free breakfast was OK. It was continental and it also had eggs and sausage. The room décor was not very good but that was not a big deal to me. "A great time in Mascoutah!" I was in town visiting my father who was diagnosed with cancer we made the trip to spend some time with him and his life partner we had a very nice time using the Best Western Plus motel I would truly recommend it to anyone who needed a very comfy place to lay their head! The hotel and staff get an A plus! The breakfast gets a C minus. The eggs that are prepared are powdered. The taste does not even resemble an egg. The sausage was cold. All other breakfast items were fine, including the waffles. Recommend to stay away from the eggs. We choose to stay at this Best Western on every trip that we take to Georgia. Always clean and super comfy beds. Staff is friendly and alway willing to help out. Breakfast is getting better. Pet friendly with a great area out back to let you stretch its legs. Nice pool and fitness room. Safe and come the interstate. Hotel is convenient to I64 and about 20 minutes from St Louis. Staff was very courteous and friendly. Room was clean and bed was very comfortable. Has indoor pool and workout room. The location is far enough from the highway to have quiet rooms. "Very average, terrible internet and boring area"
The hotel was very average, nothing to much to complain about and absolutely nothing that was done very well. Internet was sporadic, breakfast was good but boring, cable tv only had basic channels, the gym had a treadmill and thats about it. My room smelled like cigarettes. "Nice stay in convenient location"
This was an overnight stay to celebrate a special occasion with family. the location was perfect as it was close to St. Louis, the AFB, and other places we needed to be. Room was comfortable, even if a little dated. The mattresses and pillows were wonderful. Kids had fun in the pool and the outside patio was a perfect gathering place for our family. Hotel staff were friendly and professional from check-in to check-out. I would stay here again. This is a great motel when traveling with a dog. They are pet friendly and no extra Fees. Nice big king room... plenty of space for our dog to unwind after a long day in the car. The room was clean, odor free and close to an exit. Motel staff is friendly and helpful. Our second visit while traveling east to visit family and now will be our always "first night" stop. 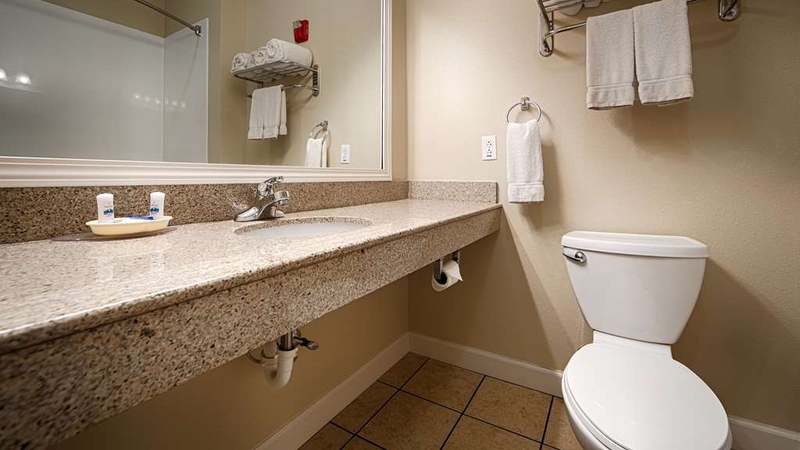 "Perfect for my Business Trip"
This hotel was exceptionally clean and well appointed. All the staff were extremely friendly and helpful. The breakfast had a great selection and stayed well stocked. The location was excellent for all my needs. It is right by the Scott Air Force Base and is a nice quiet option to the busy Shiloh / O'Fallon area. It was also right by McKendree University in the cute town of Lebanon. I will definitely stay here again when in the area. "Friendly staff & clean hotel!" The room and overall hotel was very clean! Friendly staff, especially the woman who was working the breakfast in the morning! The hotel was also conveniently located across the street from the Midamerica airport! "Great place for the money"
This Best Western is very nice. Clean, spacious rooms, comfortable bed with lots of pillows, friendly staff, pretty good breakfast with waffles, eggs and pastries. Only complaint I would have is it is kind of far from any restaurants except a Dominoes pizza and a McDonald's, but if this is not an issue for you then this is a great place to stay. "Poor Service, No Concierge Experience"
I usually stay at Best Western Hotels when I travel and for the most part I have had a good experience. Unfortunately this time I received poor service from the front desk employee named Valerie. Unfortunate she has No Concierge Experience, Valerie needs professional training! She is very rude! "No TV, No good eating"
This hotel is not convenient to any good eating places. Only Fast food and Greasy spoons. No TV reception the night we were there and no attempt to compensate for that. Had a get your money then all is "tough Luck" after that attitude. I liked this hotel, even though it was just for a stopover while driving to Florida. It was clean, the beds were comfortable, the room was big enough for 4 people. The rates were very reasonable, and most important, it is pet-friendly. Nothing really stood out as exceptional, but I have nothing bad to say about the place, either. If I was looking for accommodations in the area, I'd definitely stay here again. 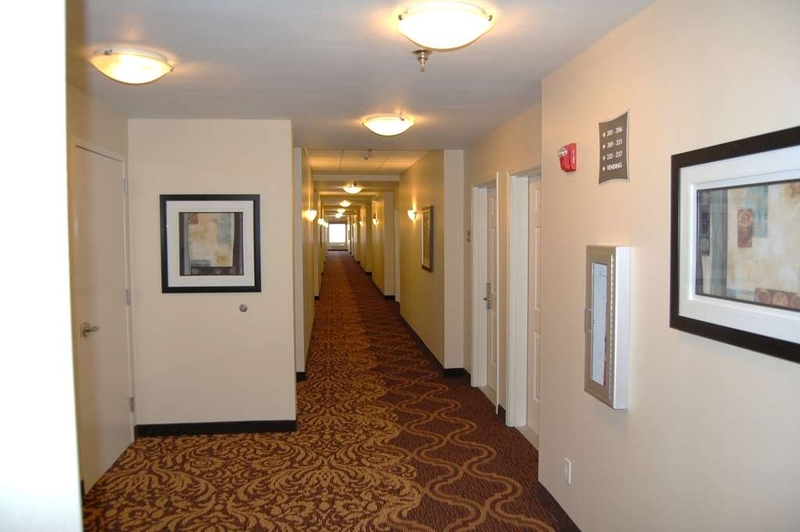 Clean rooms, attentive staff, convenient interstate access. I stayed here twice on a as I traveled across the country this summer. Rooms were clean, bed comfortable, limited food options near the hotel and the complementary breakfast was well, free. We stayed one night while traveling through the area. Hotel is nice-not extraordinary, but decent. The room was clean, but there were a few very minor issues-curtain wasn't completely attached, there were some leaves in the AC unit, etc. We had difficulty connecting to the internet and the water tasted like dirt. Just little things that didn't really impact the stay, but were annoying. Breakfast the next morning was pretty good-waffles, scrambled eggs, sausages, plus a variety of donuts, cereals, etc. Staff was friendly. "Great St. Louis area hotel"
We were looking for a place to stay while going to Eclipse Day in Carbondale. We wanted to see the sights of St. Louis while we before the Eclipse. The location of this hotel was perfect for both. The beds were very comfortable. The breakfast was great with waffles, eggs, sausage, bagels, cereal, yogurt, etc. It was by far the best hotel breakfast I have had for several years..
"Nice staff and nice room." Everything was just as we expected from Best Western, but we feel like they raised the price because the eclipse was happening the next day. It was a little frustrating that I couldn't easily discover how to turn on the shower. "Best Western in the country"
Very nice and friendly staff. Help us with our needs. Very family safe area. Highly recommend. Indoor pool ideal for the kids. Free breakfast. Nice area just to get out and take a walk. Beside interstate with crops fields all around. "Great stay - clean hotel"
Everything was great - we've paid a whole lot more for a lot less - the hotel was clean and I felt safe there alone with my three kids. The breakfast was probably one of the best - well-stocked and had things all three of my kids would actually eat. The room was very clean - so much better than other hotels we've stayed at. "Great breakfast and comfortable mattress and pillows"
We enjoyed our stay at this BW. The only problem we had was the duvet needed changed. The young man at the desk was very apologetic and quickly brought a brand new duvet to our room. Otherwise, the room was immaculate and well stocked with everything we needed. The breakfast offered a great variety of hot and cold fresh items. Kudos to the hostess who was hustling the entire time we were there. We would stay here again. We liked it better the last time we stayed here --- the price was a lot lower. What is the Plus in Best Western Plus??? (We stayed here because it is conveniently located near the Shiloh-Scott Metrolink station, and we were just back from a plane trip.) We will probably not plan to stay here again. "Still the best for the buck"
We stayed in March 2016 and because it was so good, we came back again in July 2017. Still pet friendly, no fee for our small dog. The was very clean, AC working great when it was 105 degrees outside that day, The free wi-fi was working. The free breakfast bar was very good. Had scrambled eggs, sausage patties and bacon. Also had a waffle bar with all the extra goodies. The lady working the breakfast area kept the food full and hot. She kept the seating area spotless. The pool area was clean and the pool was a nice treat with it being so hot that day. The young girl who checked us in was very friendly. This property helped make it a great get-a-way weekend. This BW had its act together. If you're traveling in this area you won't go wrong booking a night or two here. Easy access from the interstate and plenty of parking for your trailers. Clean hotel with a friendly staff. Nice pool and workout area. Breakfast is good, but still needs bacon!! Rooms are super nice with comfy beds and it's pet friendly too! "Questionable Military Discount Policy and No Internet"
This hotel is right off of I-64 and is decently up to date, but we did not have internet during our whole stay and my daughter and son-in-law did not get their military discount. They paid the same as we did for our room, even though they have stayed here several times before and have received it. The hotel was no where near full either. The property also seem understaffed. It is definitely not a four star property. "Internet was out, everything else was OK"
I have stayed at this hotel a few times. It is much cheaper than the other hotels right outside of St. Louis. It is clean, has a nice pool (open till 11pm), the breakfast is good, and the rooms I have been in are clean. The internet was out during our one night stay which was a pain. Hopefully they get it fixed quickly. Staff didnt appear to like their job. Almost felt like you were bothering them, tho they were nice, but not overly friendly. No coffee in room tho had a coffee pot. Breakfast in am was good. Nice selection of food and it was good. This is a very good hotel. Staff is very friendly and the facility is more than clean. I will be staying in this hotel when in the area. No reason to look elsewhere. Very quiet and relaxing. I have Ben staying in this hotel for a number of years and have no reason for change. "Stayed here after a really bad room at the Scott Inn. Well worth the extra money! Clean and nice!" Stayed here after a really bad room at the Scott Inn. Well worth the extra money! Clean and nice! Really very reasonable for everything they provide compared to the Scott Inn at Scott AFB. We would stay here again! This is a great hotel that is convenient to Scott AFB, Mascoutah, and Lebanon. The complementary breakfast is great! Indeed, it is comparable to a Best Western Premier hotel's breakfast that costs and extra $10 per person, plus tip. It would benefit from having a restaurant on-site or within walking distance. I stayed here for the quality and the price. Everything was clean, comfortable, and the breakfast was good too. I recommend this is the place to stay in that area. The only little problem was getting here from the base. If it's after hours of the gate you have to drive around the base to get to the hotel which still wasn't bad only about 15 minutes. If the gate is opened on that side it's a short quick trip. Great place. A clean comfortable hotel. Good breakfast, fast internet, coffee in the room, pool and nice staff made this a pleasurable stay. There are restaurants nearby. Located near the highway, but we didn't hear the traffic in our room. 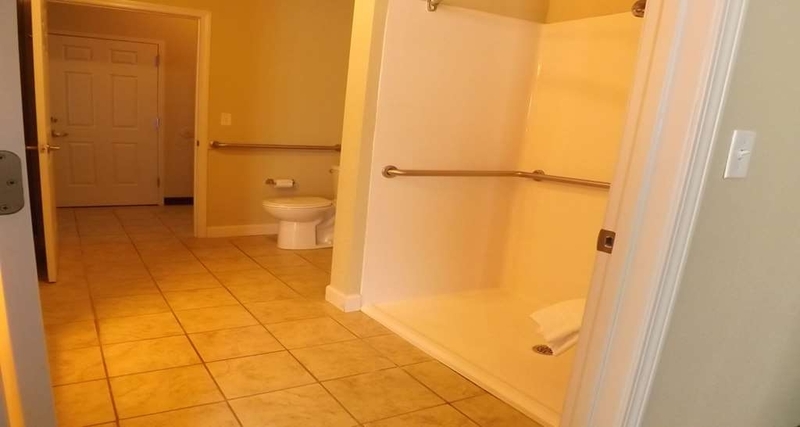 Located in a more rural area, but not far from a mall and other services. We felt safe in the area. We would stay again. We were returning from Nashville and had points from Best Western Motels from previous stays so we decided to stay at a Best Western Plus in Mascoutah IL where we had not stayed previously. When I woke up the next morning there were bugs in the bed with me. When I pushed on them to kill them they spurted blood on me. Bed bugs had been feasting on me all night! We got out of there as soon as we could after reporting the problem to the weekend motel manager. We have stayed in motels all over the United States and we have never had a problem previously. In fact, I didn't know what a bed bug looked like until then. When we got home we washed all whites in hot bleach water and dried them in a hot clothes dryer. Other clothes were washed in hot water and dried in a hot dryer. We used a steamer on our luggage and put what we could outside in the hot sun for hours. I think we have killed anything that might have hitched a ride home with us but we are remaining vigilant. The general manager of the motel never called us which I think she should have first thing so we called her. Another guest told us they had ants in their room crawling over everything. I reported the event to AAA since they were a rated motel. I have been waking up in the middle of the night and if I have an itch I immediately get out my flashlight and check. I have not found anything yet but then need a pill to get back to sleep because all I can think of is BED BUGS. Dear Mike, Thank you for your comments about your stay. I am sorry that you experienced bites during your stay. We are very proactive about pests at the hotel and I am sorry you didn't let us know while you were here. We had the room inspected when we saw your posting and did not discover any insects or bugs in the room. I wish you would have alerted us while you were here. We appreciate your feedback and comments and we hope you will give us another opportunity in the future. Good value / clean rooms. Up to the Best Western quality standards. I would love to see an upgrade in the free continental breakfasts Best Western-wide. Not a criticism of this hotel but a general suggestion. Love the location. We are close to where we just moved our son who is stationed at Scott Air Force Base. Works perfect for our family. The rooms are clean and the staff welcomed us like family. This is ideal and we love your hotel. Thank you so much! Conveniently located close to Interstate. Very nice rooms. The only discrepancy I could find is when I checked in it was around 8:30 PM and the gentleman at the service desk seemed less than enthused to be bothered by guests checking in. Rooms(and we were in three of them!). were dirty, shabby linens, lights not working. WIFI did I not work in any of the rooms---had to go out to the hallway. Maintenance terrible. Bath tub plug broken. Asked to see the manager it he/she ever appeared. Every time we have stayed at this hotel has been a great experience. I appreciate the consistency I have encountered at Best Western as a brand, and this location has always provided us a pleasant stay. It's really nice to let the kids burn some energy off in the pool, and my husband and I noticed on this stay that they now have a new lounge. We plan our road trips around stopping at this location, and will continue to do so in the future. "Clean hotel, friendly staff, nice location." My family and I stayed here for a few days for a family wedding. What a great location away from the hustle and bustle of St. Louis! We felt very safe staying in Mascoutah, and the property looks very nice. The staff were friendly, even though they were very busy with the hotel being full. The breakfast attendant was very sweet and gave our family recommendations of places to go and restaurants to try. We look forward to coming back this summer! We felt like our room was in the middle of Interstate 64. The breakfast was horrible. I was checked out of hotel while at work. Told I was able to have room until the 27th of April. The last two days of stay the rate was raised $20 for no reason, probably only had 25 guest at the most on those days. Should have checked out after the first day. This is the 4th spring that we have stayed here on our long drive home from Arizona. 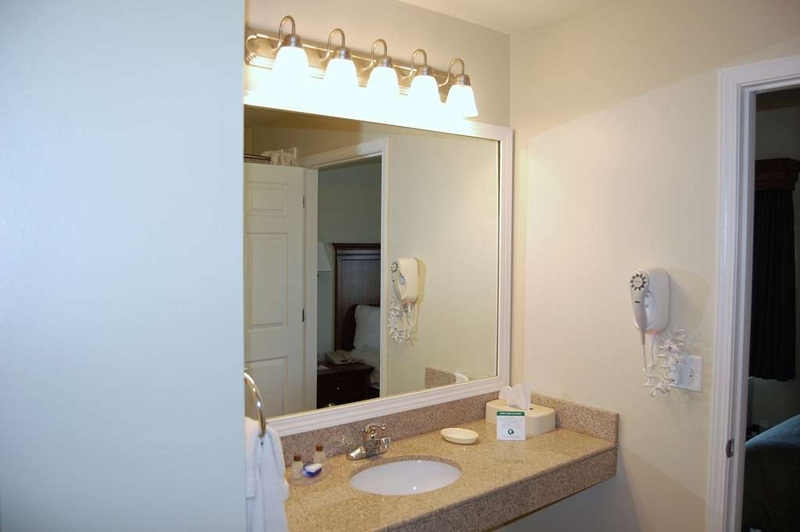 We have always found everything neat and clean, comfortable beds, and inviting surroundings. Very quiet. Easy accessibility to the interstates. Check in was easy with fast and efficient staff. My room was comfortable, quiet and felt inviting. The Wi-Fi signal was strong. I found the room very clean - the whole place was clean and tidy for that matter. Shower was hot and had good water pressure. The bed was awesome - I slept so well. Breakfast was a really good spread with a huge variety of food. There was an attendant looking after it. There was good parking and big rigs can easily park in the street out front. I would stay again. Reserved this room prior to arrival effortlessly and received great parking information over the phone. Check in was fast. Business center was out of paper and then out of ink. I could not do my office work. Tried to rest and it was just too noisy for me. Room next to elevator, laundry room, and kids at pool were having an amazing time which is always good to hear. Check out was fast and very friendly. We stopped here overnight. The hotel was quiet, easy to get to, clean, comfortable, and included the standard breakfast. Our only complaint was not enough outlets for charging phones, etc. Definitely a place I would stop again. "Near perfect unless you plan to use the fitness room"
Newer property just east of St. Louis in Illinois. Could be faster to downtown St Louis than from suburb hotels on the MO side. Very clean and quiet with quick interstate access. Good internet and breakfast. Both TVs in exercise room had lost connection to cable or satellite and staff had no solution. Also the cooling in fitness room was not working. This is our favorite hotel when we travel. Easy to get to as it's right off of the interstate. Clean and well laid out rooms and the beds are super comfortable! Nice outdoor lounge area and an indoor pool. Great place to run your dogs in the back lawns. Breakfast now has bacon!! Will always stay here when we travel back and forth from the Midwest to the east coast. The room was very clean, plenty of room. Bathroom was spacious and clean. Room was quiet even though we were near the interstate. The mattress on one bed wasn't very good but the other was fine. The breakfast was good. The room was a very good value - the rate was very reasonable. The location of this hotel cannot be beat. Scott AFB is very close for military moves. For other travelers, it is just far enough off the interstate so noise is not a problem. For southern-breakfast folks, NO biscuits and gravy..
this motel is right on the freeway ( on 64 ) is easy to get to and very clean. The breakfast is good and hot. I would stay at this motel again if I every go back to Evansville In. And the beds were very comfortable. We arrived at this hotel, late and very tired. The front desk associate made our check in very quick and painless and got us the closest room to entrance door so we did not have to drag baggage all over the hotel. Hotel room was neat, clean and bed was soft and welcoming. The room had most have experienced a ceiling water lea. It had brown stains, peeling paint & drywall tape & a black patch that may have been the start of mold. The cleaners did a very poor job of cleaning or not cleaning the room at all except for making the bed. Overall a good experience. The quality of breakfast items does need improvement, but there was plenty of food. The hotel staff especially at the counter were outstanding (professional and courteous). A little improvement and detail on stocking the rooms with coffee/tea would be helpful as well as a good thorough room cleaning. There was quite a bit of dust on the lower shelves and in corners along with a less than average good carpet cleaning. I would stay there again, but would like to see the above improvements. "Looks like a new place"
I don[t know how old this hotel is but it looks like it is brand new! We enjoyed our stay. It was quiet and comfortable. We took an evening walk outside because it is away from the traffic areas. I would definitely recommend it if you are in the St. Louis area. "Out in the middle of nowhere, but still pretty good"
Quite adequate, but not superior. The fold-down bath seat needed some adjustments and there was no maintenance staff on duty, but the front desk clerk was able to provide the tool I needed to fix it. Room was comfortable. Breakfast only so-so: reconstituted eggs and greasy sausage patties, mediocre coffee. Stayed at this hotel as it was close to family in New Baden. We had a family reunion so being close was important. Breakfast was ok...hotel was clean and staff was pleasant and helpful. Pool was nice but a little too cool for me....I would stay here again if I was in the area. As we traveled toward St. Louis, we decided choose lodging away from town to avoid any possible unrest that had been occurring in parts of the US. We booked a King with sofa bed (Room 201) for a total of $108.90 for a single night. The room had a microwave, refrigerator, hair dryer and a desk. The bed was comfortable and clean. In fact, it was the most comfortable bed of all of the hotels that we stayed during our vacation. The one drawback was the loud stairwell next to room. The stairwell door would slam and was loud in our room. There isn't anything around to eat dinner. The property is surrounded by farm land and I-64. As far as breakfast, it is mostly standard fare for a Best Western. It was nice to have a separate counter for the waffle maker and oatmeal. The dining area was spacious. The food was stocked and the woman did a good job keeping up with food for the guests. TIP: You will need to drive to get dinner if you stay at this Best Western. There is a gas station at this exit. TIP: Ask for a room that is not next to a stairwell. The loud stairwell phenomena is a design flaw that I have encountered at other Best Western properties that were originally built as a Best Western. Beautiful hotel but the breakfast is horrible. You should just plan on going to McDonald's. There was no milk or orange juice and a very limited selection. There was no one to ask for help either in the breakfast area or at the front desk. We tried calling twice for help and no one answered and no one was even at the front desk to check us out. For such a nice hotel, it was very disappointing. This was what we expected from a 3 star hotel. The breakfast was not anything special. I've stayed at other 3 star hotels that had a more comfortable bed. There was little to choose from. The room was very clean. We did not use the pool but it looked a little cloudy. "Awesome Breakfast and Super Clean!" Staff was professional and very courteous - the room was immaculate. The beds and pillows were very comfortable - both my young children and elderly parents had a great night's sleep! We enjoyed swimming in the pool, which was the perfect temperature and extremely well cared for and clean. We also enjoyed the exercise room. What I was most surprised by was the free breakfast - amazing!!! HUGE selection of fresh baked goods, fruit, cereal - scrambled eggs were delicious and the coffee was super fresh and hot!! Will definitely stay here again!!! "Very Clean and Comfy. My Kids Loved The Pool Area"
This hotel was great! I was really impressed. The rooms were very clean, comfy and updated. My Kids Loved The Pool Area. The Free Breakfast had tons of options. The hotel staff was friendly and professional, everything was always very clean! The beds were super comfortable. Would definitely stay here again. "Peaceful location, great for families." This hotel is right off the interstate off a quiet street in a semi rural setting. Very quiet, peaceful, and safe for my young family. The kids loved the indoor pool. I highly recommend this hotel to anyone traveling with their family. "A decent place to stay on a long drive"
Stopped here on a 97 degree summer day while enroute on a long trip. Decently clean but not very quiet as it's located by a highway. My air conditioner was set on 60 and drapes were pulled shut when I walked into the room. Kudos to housekeeping for being thoughtful but it was still a bit warm all night even with air running. Since I was on the 3rd floor...it would make sense. The only points I would take off for would be road noise and the holes in the comforter. Would stay here again though! Helpful and attentive staff . Great location with easy highway access, but quiet with a relaxing and private setting. Room was clean and well-maintained. I will stay here again, and would recommend to friends and colleagues. If you fly Mid America Airport with Allegiant, this hotel will exceed your expectations. Location is superb, service is great and the hotel is clean and new!! The presence of this hotel made our flight experience much more enjoyable due to location. "1st stay at a Best Western Plus"
This was a very nice facility, it was a full facility. We stayed there because we were in the area for a wedding. I would compare it to any other motel we have stayed in-in the past 10 years. Good staff, good room, bed was very comfortable. There wasn't much of a variety of tv stations, but we weren't there long enough to really watch much tv. My only complaint was that the eggs were cold during breakfast. Otherwise, this facility was a nice as the many others where I have stayed. It is not dog friendly. "Facility is nice, unlikely to stay that way." Overall, this stay was what I expected for the price, I guess. But, I've had better stays at this brand for the same price range so I was hoping for more. We stayed here as a cheaper alternative to staying in St. Louis and then we took the Metrolink into the city to see the Cardinals game. We called ahead to see if we could get an early check-in. The person I spoke to on the phone was very helpful...her outlook needs to spread to the rest of the staff. The desk clerk there when we arrived said we could not get an early check in--it would be another hour. When I said I'd been told we could, only then did she decide she COULD reassign a room and make us keys (my guess, that had all been batch prepared earlier and she didn't want to have to redo anything). Not ideal customer service. But, we did get into a "clean" room. The room was nicely furnished and APPEARED clean--if you didn't look too hard. However, after I took my shoes off, I see an OPEN, RUSTY SAFETY PIN on the floor of the bathroom. I'm glad I saw it with my eyes instead of finding it with my foot! After that, I looked a little closer. The floors were plenty dirty in general. There was even some food that was not ours under the end table. Yuk. That makes me question how clean everything is. Are the duvet covers regularly laundered? I suspected not based on the floors. But, the internet worked. The TV worked. The A/C was cold. The bed was comfortable (even if the sheets were threadbare and I refused to use the duvet). Breakfast was pretty good, too. Good selection and plenty of everything. I wouldn't expect much more in this price range. However, my biggest issue, is that this is where I'm first sharing what I thought of the stay. I saw staff in the hall and checked out in person yet no one asked how our stay was. No one seemed concerned. If someone had asked and cared that our room was dirty, the sheets were thin, and there was a sharp, rusty object left on the bathroom floor, they might have had a chance to make me feel better about the stay in general. But, customer service doesn't seem to be a top priority for most of the staff. IN SUMMARY: If you need to stay in the area on a budget, this place is fine if you don't expect too much (although, it could quickly deteriorate based on how well it's being cleaned and cared for). For us, I think we'll shell out a few extra bucks next time and choose a hotel near the next closest Metrolink stop. This hotel is always our first choice on our business trips. Great outdoor gathering place. Breakfast is getting better all the time. Beds are super comfortable. Easy on and off access to Interstate. Nice big space for your dog to run. The staff is always very pleasant. "Perfect for St Louis Trip"
When I'm on a long road trip, I need a good night's sleep. I was surprised by just how close this hotel sits to the Interstate, and upon check-in asked for a room away from the road (and a number of other room location requests). The staff was very professional and did their best to meet my requests. The Air Force Base wasn't a concern for me - I'm used to air traffic. Semi-trucks, not so much. I did get a good night's sleep, and as this location is under a year old, everything is new (for people that like shiny). I don't understand all the reviews I read complaining about BW breakfasts. The prices for the rooms are reasonable and the breakfast is included in that price. BW doesn't claim to offer Dining At The Ritz. They provide cereals, yogurts, waffles, juices, breads, pastries, and eggs nicely presented. "Comfortable, quiet place to stay"
Best Western Plus Mascoutah is in a nice remote location near SAFB. The looks new and is very nice. We were able to quickly get to shopping and eating locations and it's not far from the St. Louis area. "Awesome find near Clinton County!" My husband, three grade school aged children, and I booked a room here for four days for a family funeral and we were so impressed by this little hotel. We stayed at the Baymont Inn in Highland before at a higher rate, and this hotel was way better! It has a nice sized indoor pool for kids to use, very modern rooms and comfortable beds, prompt room service, and lots of details at the breakfast. They offer salsa and shredded cheese for the eggs, a variety of waffle toppings so kids can make a sweet waffle, actually good-looking fruit, a variety of yogurts and some pretty darn good coffee. It's location couldn't be better driving down from Chicago on interstate 55. It's close to Clinton County and I highly recommend it over any other hotel in the area. This is our go-to hotel now. Keep up the excellent work! I wish that all hotels were like this one. The rooms are large and the entire place is clean, with no odours. The breakfast is good and there is lots of parking. There is a pool, but it is fairly small and it looks like the hot tub was filled in. The location is not the best, but there is a McDonald's with an awesome play place close by in Lebanon, and it is fairly close to the end of the transit to St. Louis. We would definitely stay again if we are in the area. Price was great. Staff was friendly and helpful. Room was nice, clean, and the beds were really comfortable. We'd defiantly stay here again. My wife was really satisfied as well and she's not easy to please. Even after the breakfast time we still had coffee available and the staff gave us some yogurt and hot cocoa. Just a nice hotel to stay at. "Great stay with awesome front desk Chris"
Wonderful Oasis for the weary traveler. This hotel has great staff and is maintained in like new condition. Chris at front desk was warm and welcoming. The breakfast offered hot scrambled eggs and sausage as well as waffles, yogurt and all the fixings. The pool, business center and fitness center are all inviting and in good shape. I love the tall ceilings and living room with bedroom area. We have stayed here for 8+ years since it opened brand new and return every year several times. This new edition to the Best Western Portfolio was a pleasant surprise. It was in the middle of nowhere but right off the interstate and just east of St Louis just where we needed to stop for the night. It was very neat, clean and well organized and not crowded. Night clerk was very helpful and efficient. We stay at this hotel several times a year for our business trips. Far enough away form the hustle and bustle of St. Louis, but close enough to get to enjoy the big city. Very nice rooms and comfortable beds. Breakfast could be better, but it's enough o get you going in the morning. Wifi is really slow, but that is our only real complaint about the hotel. We would recommend this hotel to anyone! Clean room with enough amenities. Good exercise room and the removal of the hot tube in the swimming room actually is addition by subtraction. Chlorine smell used to be too strong. Now a nice sunny room with a fine pool. Same buffet type breakfast as vast majority of BW properties. But I guess I am getting tired of eggs with too much condensation from top of chaffing dish, PB with trans fats, and no potatoes of any sort for last couple years. My stay at your hotel was very pleasant and enjoyable. I was in the area to visit family and friends and some of them came to visit me in my room and remarked how nice it was and how clean everything was in the hotel, I thought the breakfast was very good but I thought some English muffins would be nice. We spent 3 nights here on a visit to family. Everything was pretty basic. The room was clean and comfortable. The fitness center had adequate equipment but the treadmill was not operational. Breakfast room did not always have nonfat milk and pastries were dried. Front desk was usually not staffed and when it was the person was not very knowledgeable. Very nice rooms. New looking or has been updated. No stains anywhere. Very clean. Beds are pretty comfortable. Staff is refreshingly friendly. 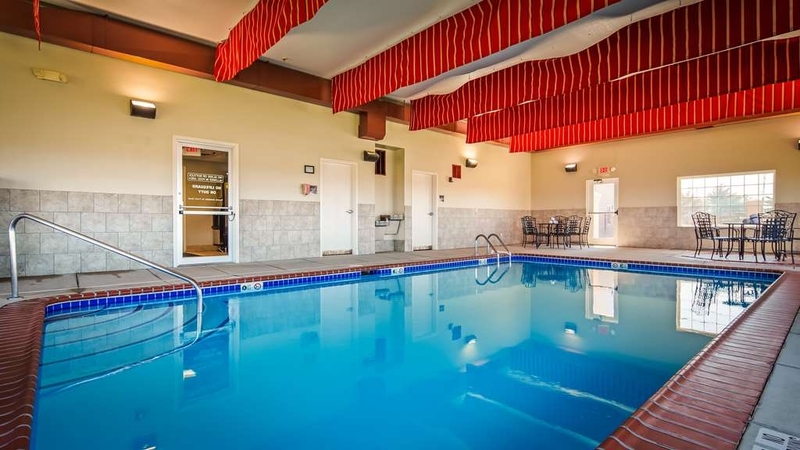 Indoor pool is extremely small, so if you're staying for awhile just for it-don't. There's a mini frig and microwave in room. Bathrooms are also very clean. We're satisfied and happy we found this place. I would stop here again. Great value for the money. I recently made a trip to Mascoutah, Illinois due to a death in the family. I stayed at the Best Western Plus located at Illinois 4 and I-64, They treated me like I was the most important person there. The room was clean and comfortable. They made a sad trip nicer. Thank you Best Western. This wound up being a perfect location to stay for a visit to St. Louis. It's just a 30 minute drive into town, but the hotel is located in a safe, quiet area with very little activity around. The room was comfortable and clean. Had a king size bed, couch, chair, and a desk for work space. Large TV, too. Breakfast was what's to be expected for an inexpensive Best Western. Only complaint would be that the indoor pool was pretty cold. The stay was definitely worth what we paid. First, this place really is "pet friendly" as there was no charge for our small dog. Second, this property was very well maintained inside and outside. You could smell how clean it was when we checked in at 4:00 pm. This property is 8 years old but looks new. Third, the morning breakfast was awesome. It was hot, well stocked on all the food they offered, They had Belgium waffles, scrambled eggs and sausage patties along with some fruits, cereals, breads. Also had apple and orange juice to choose from. The girl in charge of the breakfast bar took pride in her job, as she kept up with stocking, cleaning up after all the people and their messy kids. I hope to stay again and use the pool next time. The only negative is the bed was HARD, but we are still coming back. We did have to ask for help on how to operate the shower, it had a pull down ring diverter on the faucet to activate the shower. Never seen that before today. Much, much better than expected. In our King bedroom we had a loveseat and chair that matched. Breakfast was ok but not as good as LaQuinta. The bed slept great! Best of all they take dogs without an extra fee. "Great place to stay for McKendree University visits!" My son goes to McKendree University and this is a great hotel to stay when we go to visit and for games. It is clean, the staff is friendly, and the internet actually worked! I will be staying again and would recommend this hotel to anyone who needs to stay in this area. We always enjoy staying here on our way to and from GA for business. The rooms are clean, the staff is friendly, and we love that it is pet friendly. The breakfast is ok, not great. The wifi is very weak so we just use our cell service as a hot spot for internet. "Good Hotel Not Much Other Choice"
Stayed here for 3 days on business. First assigned room, door didnt close or lock. Looked like the tongue on the door didnt line up with the strike plate or hole in the frame. The door would close if you held the handle down to retract the tongue but wouldnt stay closed. Was put in a second room which was excellent. Bedwas comfortable, pillows fine as well. Hotel had Hughes-Net for internet service and it was great. Service was up all the time. You did have to log in each day but no big deal. Not much in this area as far as hotels unless you drive a ways. Pool was clean, fitness center small but adequate. Breakfast was served each morning and nothing fancy but again it was adequate. Their coffee was noticably good which was surprisingfor free hotel coffee. A/C worked fine to keep roo comfortable. TV worked fine as well. Business center available 24/7 and printers worked too. Front desk staff very helpful. Best rate was through Trip Advisor! Stayed here on business in Mascoutah. It's the only hotel in or near town. Rates were great, they offer breakfast each morning, although it's the same scrambled eggs and waffles along with the usual cereals. Their coffee was surprisingly good! Room was comfortable. King size bed was also good but pillows a little hard. There was an indoor pool and fitness center. Adequate parking around the building and it's right off US 64. All service was very good. Comfortable and quiet, clean with very polite and helpfull staff. A good place to stay over night or for a few days. Did not have the opportunity to use the gym or pool but the rest was very appropriate to rest and recuperate. The hotel although located on the outer edge of the area is located conveniently just off a major highway. The staff were friendly, easy to work with and allowed us to check in early to our room. The breakfast was acceptable and offered a variety of choices for food and beverages. We stopped at this Best Western and didn't know what to expect. It appears to be a fairly new facility. It is not in the same class with most Hampton Inns, Fairfield Inns, etc., but it was suffiicient for a night of sleep. The breakfaast buffet had the basics. The coffee was good. All in all a good value and a good place for a night of rest. This is the second time we have stayed at this hotel on our way to Arizona and it has been truly a pleasure after a 12 hrs drive. This will be our stop for the night every time we head west. We also really enjoy the full breakfast which is included. very good for the rate. internet works well. nice fitness room. Easy on easy off. clean room pleasant staff. good breakfast. not many restaurants close by but the one across the road provided a conveinent option for dinner. "Disappointing For a Best Western Plus"
First, the pros: The girl at the counter was very friendly and helpful. That's the only pro. Cons: The room was very musty. It triggered allergic reactions for all us so none of us managed to get much sleep that night. We'd already had a long day on the road and had another long day ahead, so the lack of sleep was problematic. When it comes to hotel breakfasts, I'm not at all picky but that was by far the worst hotel breakfast I've ever eaten. And we travel A LOT. Overall, very disappointing for a Best Western Plus. We stayed here on the way back home after the holidays. The Beds were super comfy!! The Breakfast hit the spot and the employees were very friendly! We did have a slight issue upon check in, but the employee was very considerate about everything. I'd definitely recommend this hotel and would love to stay again next time we are in the area! "Economical not far from St. Louis"
This is the second time I have stayed here. The room was excellent. the Staff was wonderful. I love this place all except the breakfast. The eggs were rubbery and they did not have english muffins. So, the breakfast was a disaster. But, I will stay here again. The location is excellent near Scott Air Force Base. It is also very quiet. No problems encountered other than th disappointing breakfast. "Nice Hotel--Not so nice staff"
Have stayed at this property before. The rooms are clean & quiet--my main requirements. The staff was not particularly friendly---no offer of drink & snack that is to be offered to BW Diamond member...no room upgrade available even though the hotel certainly did not appear busy...at check out, the personnel didn't seem to care much about anything. Again the room was clean & quiet, so probably would stay again if in area. This is one of our favorite hotels to stay in whil we are traveling between our two shops. Excellent rooms and always a welcoming staff. Great location off of the interstate. Decent breakfast, comfortable beds, and nice pool. Pets are also welcome which is great for us. We selected this hotel because it was pet-friendly and close to friends we were visiting. With a fair amount of hesitation, we booked two rooms. I say "with hesitation", because a few years ago we were on a cross-country motorcycle trip & stayed at three different BestWestern locations i. Three different states, and were beyond UN-impressed. Those locations felt dingy, run-down, and staffed by inattentive people. The Best Western Plus in Mascoutah was the complete opposite; clean, light & open-feeling, a first-rate staff, great rooms and a tasty breakfast spread! We will certainly return to that area to visit friends, and we will definitely stay here again!! "THE Place to Stay in Scott AFB, IL vicinity"
If you plan on staying at any motel/hotel in the Scott AFB, IL, vicinity, don't give it any thought; just reserve your room(s) at this Best Western. Tops in staff, courtesy, cleanliness, price. They are just great people offering a great product. Frankly, I wish I could have extended my stay. Average BW hotel, not a great value. Coffee maker in the room did not work, internet access was clunky and a couple other items in the room needed repair. Only one night, would not want to make an extended stay. Chose this hotel for its location (reasonable distance to Scott AFB) and price. Room size, layout and furnishings were superb. Accommodations were spotless and seemed newly built although I understand the hotel was actually refurbished two years ago. Staff at the front desk and housekeeping were very friendly and professional. Christine, the general manager, made us feel like VIPs as did the rest of her staff. Very nice fitness area and inside pool. Great place to get a workout. Enjoyed the free breakfast. When I visit this area in the future, this Best Western will be my first choice. Spending a Thanksgiving family reunion in Belleville Il. 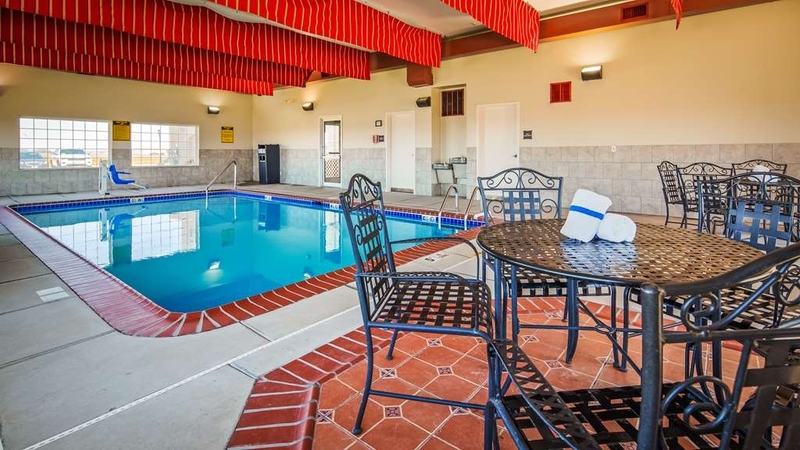 we chose this Best Western Plus Mascoutah/SAFB for the location and ease of access to the surrounding area. We had two rooms reserved and the price per night plus no pet fee and location far exceeded our expectation. As others have mentioned, this B/W is a bit of a mixed bag. First the good - the room was large and spacious, the bed was comfortable. It was reasonably quiet considering it basically faces the interstate. The not so good - the shower control was plumbed backwards, the handle needs to point to 2 o'clock to get hot water, opposite to what the label on the faucet says. The shower valve is a ring on the tub spout, pull it down to get the shower. Otherwise, this B/W is typical of the chain, the staff are reasonably good, the breakfast is average for this level of hotel. If you are passing thru, it is a convenient stopping point, though aside from HuddleHouse, the nearest restaurants are not very close. First let me say that the hotel and the room I had were clean. First impressions are everything and waiting at the front desk for someone to show up to check me in might have been overlooked but for the person who finally did check me in. Unpleasant and the attitude from her was as if I was a bother. Places to eat within walking distance was a gas station. There were burnt out light bulbs in the bathroom and the fan in the bathroom did not work, Although there were directions (sitting on the front desk mantel when you come in) as to how to operate the shower those directions were incomplete. Then the coffee maker in the room was also broken. A high note was the over night staff person was very pleasant each time I had to call to the desk to ask about things. However the person who then checked me out in the morning could not smile and was dismissive. This hotel has so much potential if only they would train the staff in customer service. Very new and updated accommodations. Very easy to find, Right off interstate. Gas and a Huddle House are directly across the street so you can gas up and have a hot meal. The room was large and spacious. The shower head could have been better. Not much water or pressure. Very nice staff. "A very nice PLUS Best-western Hotel"
This is a very clean, nice, comfortable accessible hotel. The staff is friendly. The breakfast area is quite large for the size of the hotel and well supplied and maintained. The Motel is EASY to find whether coming south from Lebanon or off of I-64. In traveling west toward St. Louis & further, I would definitely consider staying here again. This was a central meeting point for family from WI, GA, & OK. The staff was wonderful and very accommodating, the facility was extremely clean, and our family made some memories to last a lifetime. We will be going back in about 4-6 months to do it all again. The beds were very comfortable and clean. It was a very clean room. It took a few minutes for the front desk to respond to the push of the bell on the desk. once she came out, our service was done quickly and efficiently. the room was very clean and comfortable. I thought everything was excellent and I would use Best Western again. The only downside was breakfast. The eggs were not good and the rolls were not so great. Everything else was fine. Not bad but I have had a lot better. Close proximity to shopping, restaurants and attractions. A short drive into the heart of Saint Louis. Very nice accommodations and amenities. Also close to the Metro train stop at Scott Air Force base- at Shiloh. was like a newly opened hotel. easy off the interstate and away from the hustle of St.louis traffic. food at the next exit west. room was spacious, clean, and great bed. nice pool if you have time. this is a winner. "Clean and organized but not very friendly staff"
The hotel was clean and organized but not very friendly staff. I think in the whole hotel, there was only one person available. Also don't count on the breakfast. The breakfast quality is very low. Finally, the night we stayed there there was a group of 10-12 loud and and drunk middle age guys (very scary bikers) which kept me awake and concerned through the night. "Right off interstate, not convenient for places to eat near hotel, otherwise GREAT!" Traveling cross country for personal business, the priority was clean, quiet, comfortable. This hotel provided all three and even more. The staff were all extremely helpful and pleasant. The room was flawless, quiet, very comfortable bed, nice bathroom including all personal electronics - hair dryer, iron, and coffee maker. I was on the second floor which was easily accessible by elevator or stairs. The breakfast included scrambled eggs ( a bit dry for my taste), flavorful sausage patties, and all accompaniments including waffles. The coffee was good which was a nice surprise. Apparently the hotel is approximately 7 years old but has undergone a very recent upgrade which was obvious. I found everything very accessible including an oversize parking lot which easily accommodated my vehicle and a small trailer. This hotel is located right on the interstate, but when arriving around 9pm, very little restaurants were visible nearby except Huddle House and a fast food restaurant. The front desk clerk provided a handout listing approximately 6 area restaurants - 3 downtown about 8+ minutes away and some that were further away. I would really suggest the handout be updated with a bit more information including more specific directions and distances. The only complaint I had with my room was that the tub/shower drained extremely slowly, visibly clogged with hair. I passed this information along to the staff and they said it would be taken care of immediately. This hotel met my needs as a stop along the way. It was priced below median level for the area. This hotel was extremely clean. The staff was very courteous. Our room was absolutely amazing. VERY comfortable bed along with a CLEAN bathroom, which is a MUST when I stay at hotels. The location was in the "boonies". Very quiet location. This was our second stay here, the first since the property switched over to Best Western. Rooms were clean, but that was about it as far as positives. At about 2 a.m a party began with the arrival of a group that had been out all night, apparently. At that point we had been asleep since about 11. People running up and down the halls, slamming doors, yelling and talking loudly, you name it. The front desk did nothing to stop it. When we checked out the next morning the clerk on duty just sort of shrugged and said sorry. And then proceeded to check us out of the wrong room, giving me someone else's receipt. This was after I told him the room number and given him our key cards. I have written corporate as well as the GM, Christine Hayden. We'll see if they respond. I was traveling late evening and looking for a hotel that was not in the middle of everything. Found this hotel and was quiet and had easy access. Lots of room to park. The rooms were clean and bed comfortable. Staff was friendly upon check in. Will most likely stay here when traveling through again. "Good value but breakfast needs work"
The hotel was well equipped, modern and clean.. HVAC was a bit underpowered but staff quickly provided a fan to circulate the air, Breakfast was typical Best Western and not the worst on this trip, but adequate. Rate was among the lowest of comparable properties we visited. Very nice hotel Have stayed here before and it has always been a good experience. Convient to Lebanon, New Baden, and OFallon for dining and shopping/touring. It is out of the bustle of being in town and is a conveint hotel if you are going to Scott AFB. "Great hotel near Scott AFB"
Amazing hotel close to Scott AFB. Best western was super clean and was less busy than hotels in Shiloh, IL. The breakfast was great and the rooms were the same quality as Drury Inn in Shiloh, IL. Very satisfied. "In the middle of nowhere but nice"
This hotel is located off the interstate and literally between two corn fields. The room was clean. You can hear trucks on the interstate. There is no restaurant at this motel. There is a Huddle House across the road, not necessarily walking distance. Any other food is down the road in the city of Mascoutah. The breakfast offered in the morning was powdered eggs and sausage patties. There were a few cereals and yogurt offered. The staff was friendly and helpful. For an overnight stop it is not bad.